Dishwashers are slowly becoming a reality in most Indian kitchens because they significantly reduce the time spent in getting rid of tough food residue leftover in the utensils. Dishwashers are also increasingly becoming more energy efficient and thereby help in saving the energy and water usage. 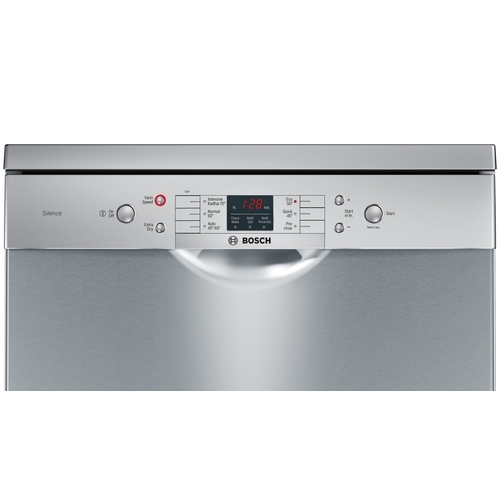 The dishwasher we are reviewing today is the Bosch Dishwasher, Model Number SMS60L08IN. The Bosch SMS60L08IN is power packed with various features. To begin with, although it is a free standing dishwasher, users have the option to get this dishwasher installed as a built in appliance. So, depending on the size of your kitchen, the space available and your preferences, you can opt for either of the installation methods. 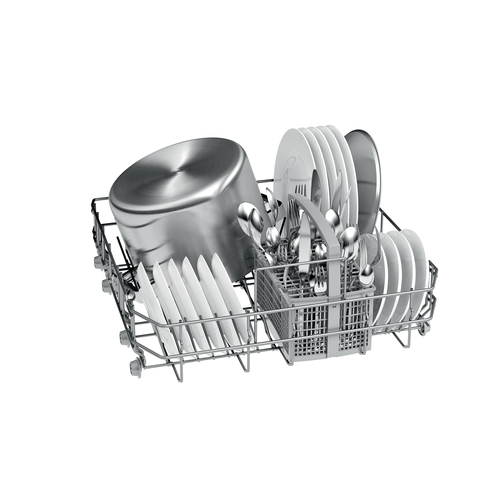 The size of this dishwasher is 60 cm (84.5 (h) * 60 (w)* 60 cm (d)), which implies that it is a full sized dishwasher with a capacity of around 120 items (12 place settings) that can be washed at once. 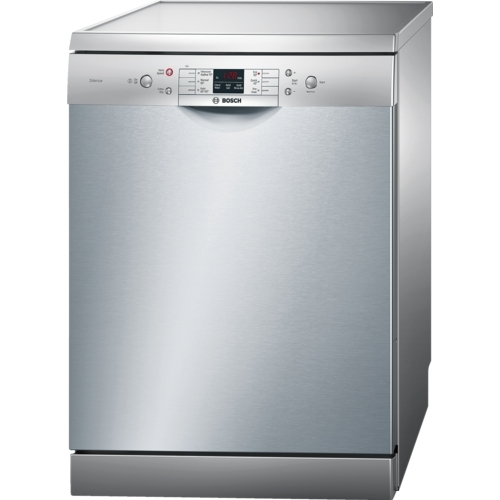 Therefore, if you often have dinner parties or have a large family to cook for, this dishwasher is ideal for you. The large capacity further ensures high water & energy efficiency. Unlike most dishwashers, this dishwasher does not make much of a noise. With the advanced feature of Eco Silence Drive, this dishwasher by Bosch produces a sound level around 52 decibels which makes the unit very quite while running a wash cycle. The appliance comes with a unique brushless motor which is powerful, efficient and durable, apart from being quite. The motor also ensures low power consumption and high cleaning efficiency. The motor has inbuilt magnet technology which works without friction and ensures protection against wear & tear. There are a total of 6 wash programs that can be selected on this appliance. These are: Intensive Kadhai 70 °C, Normal 65 °C, Auto 45-65 °C, Economy 50 °C, Quick Wash 45 °C, and Pre - Rinse. 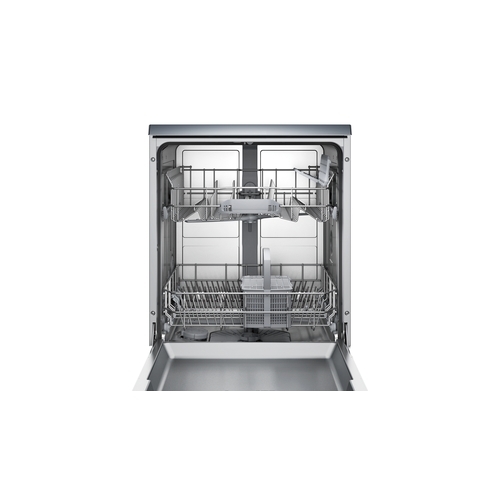 Each of these features ensures that the best performance is guaranteed when the dishwasher is being used. The Intensive Kadhai 70 degree Celsius is a special program that ensures intensive and hygienic cleaning for the Pots, pans and kadhai’s used in the Indian Kitchen which often get heavily soiled due to the nature of the cooking and require intensive washing and drying. The Auto Program is perhaps one of the best features in the dishwasher. The Auto Wash feature adjusts the water usage, water temperature and rinse time based on how dirty the dishes are and gives an optimum wash, irrespective of how soiled the dishes are. This is also the reason, why you don’t need to rinse your dishes with water before putting them in the dishwasher, thus majorly saving water. The appliance comes with two special features: Vario Speed and Extra Dry. The Vario Speed option reduces the wash cycle by up to 50 % without compromising on the wash quality and gives optimum cleaning and drying results. However, the energy and water usage in this mode may go up. The extra dry option is especially useful if you use a lot of plastic items or other items which may be difficult to dry in the dishwasher, as this mode ensures enhanced drying. An important feature is the Aqua Stop which prevents the product from damaging in the scenario that there is a water leak. The feature makes sure that water leakage does not damage any part of the machine as the moment water leakage is detected; water flow is immediately stopped, thereby saving the device from getting spoilt and the house from getting dirty. In fact, Bosch claims a 100% lifetime warranty on this product, which speaks volume for the quality of this product. This dishwasher comes with an electronic delay timer. With the time delay function you can pre – select the wash program for the desired start time which enhances the ease of usage as you can decide when the device should start, whether while you are at work or at home. A display indicator in the front indicates the precise remaining time. One can set up a time delay of up to 24 hours. With the load sensor feature enabled in this dishwasher by Bosch, it rates high on energy and water saving. The rotary speed sensor of the appliance detects the size of the load and uses only that water as is needed for the perfect wash. Therefore, even if you have a small household and don’t usually end up with enough dishes to fully load the dishwasher, you can still opt for this appliance. The appliance consumes around 1.02 KW/ H energy and 11.8 liter water in the Eco mode wash program. The device also comes with child lock and has the glass protection technique enabled, so you can wash your glass items without a worry. The Child safety lock ensures that no changes to settings can be made while the dishwasher is being used. The Bosch Dishwasher SMS60L08IN, comes in a Silver Inox color, and is made of stainless steel, which lends a sleek and stylish look to the appliance and adds to the aesthetic appeal of your kitchen. The stainless steel element also ensures that the interiors of the device are sturdy and maintenance free. 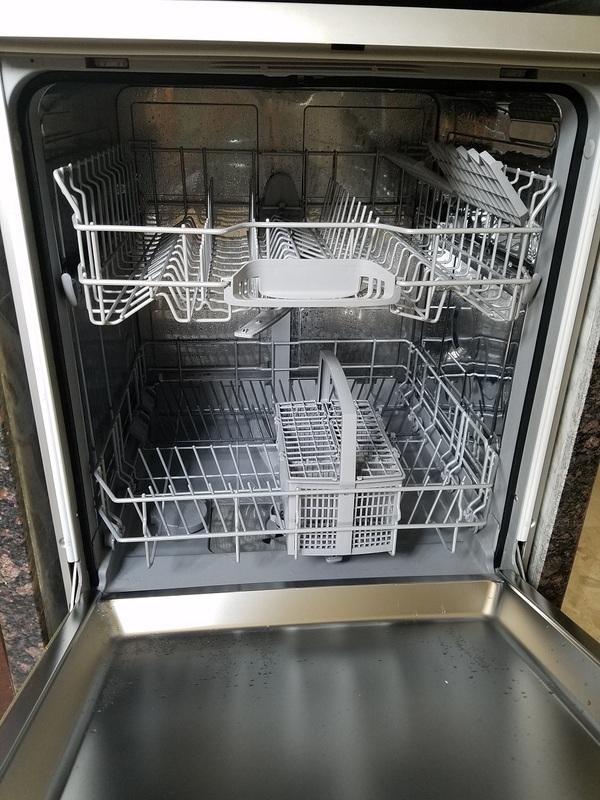 Stainless-steel dishwashers can employ a lower-wattage heating element for drying, which saves energy and helps protect heat-sensitive items on the lower rack. They are also quieter, easier to maintain, and more efficient during drying cycles because the metal reflects heat better. The device has the following indicators – LED salt refill indicator, LED rinse aid refill indicator and a time remaining indicator. The top basket is adjustable and therefore, enables the user to place large items in the lower rack, thus easing the wash process of large utensils. The bottom basket has two foldable plate racks in bottom basket. It comes with a button suspension. There are also designated washing zones in the racks, which makes the utensil stacking process simple. 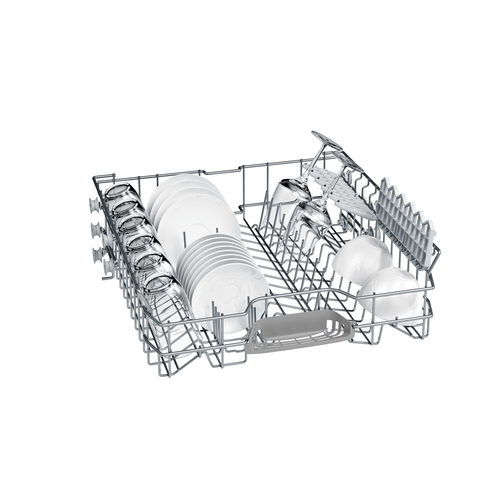 The Bosch Dishwasher, SMS60L08IN, ranks high in the performance area. The various features packed in this 60 cm appliance ensure optimum cleaning performance of your utensils. The normal wash cycle does a good job of removing the stains; masala stains also get removed easily. Sticky oatmeal and dried milk stains are extremely easy to remove. Absolutely no re-deposit of food was noticed (that is, after the dishes are cleaned of the food, no food was re deposited on to the clean dishes). The dishes also turned out completely dry. 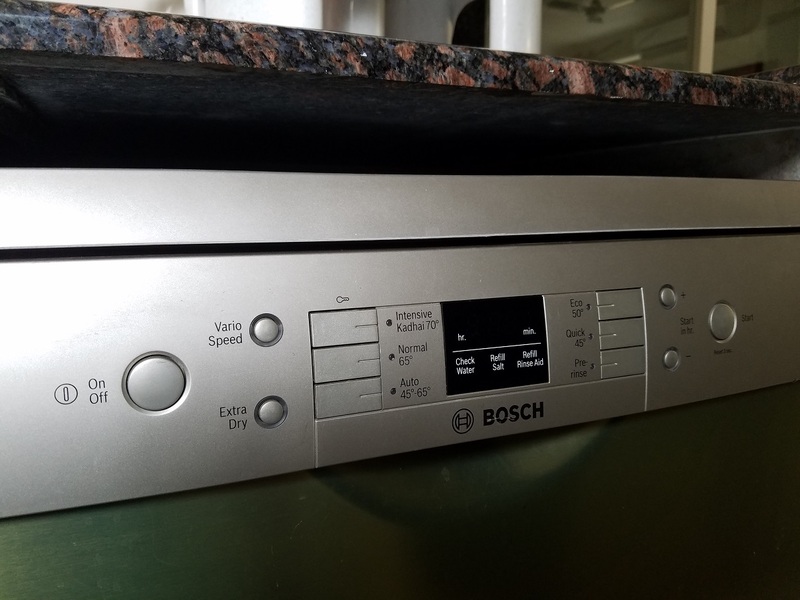 The Bosch dishwasher, as already mentioned is really low on noise when a wash cycle is on, therefore, you can leave it overnight or even when you are in the kitchen and the noise won’t be a nuisance. Bosch is a world class brand and has service centers in almost all major cities of India, with local dealers in smaller cities catering to the serving and installation requirement. Given its size of 60 cm, this dishwasher may not be ideal for small kitchens. 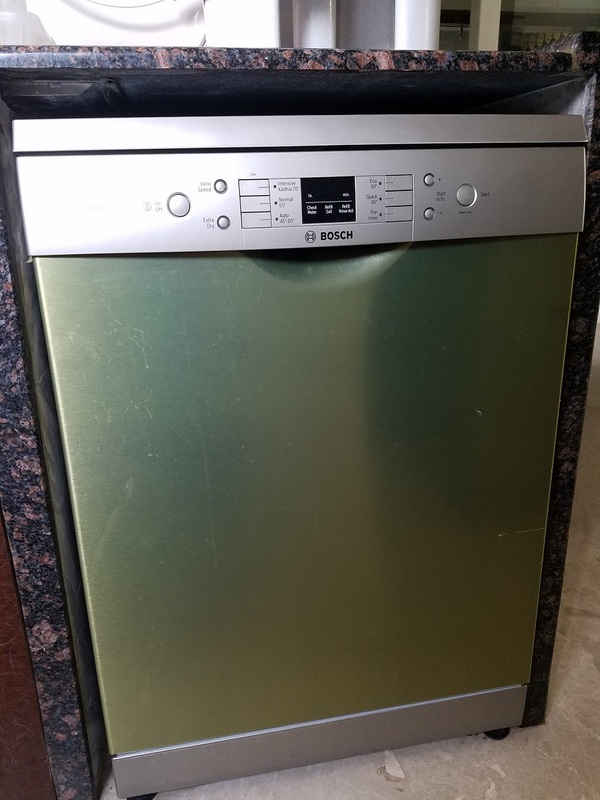 There are a lot of pluses in this dishwasher and it truly combines some essential and some luxury features for the correct price. You name a feature and this device has it: Aqua and load sensors, soil sensors, energy saving short wash cycles, adjustable utensil baskets and foldable racks, low noise, delay start, and child safety lock.